There are a number of products that always come up when you talk about natural remedies. For example, ginger has been a mainstay in natural treatments and recipes for centuries. But what about ginger tea? Sure, it’s got ginger in it, but do the health benefits remain in tea form? Do they decrease? If you’ve ever wondered about ginger tea benefits, you’ve come to the right place. From the health benefits of ginger tea, to ginger tea nutrition facts, think of this as your beginner’s guide to ginger tea. We’ll even give you a few ginger tea recipes that you can try at home. Sometimes we can overlook the simplest of nature’s ingredients that have great health benefits—and ginger tea is one of them. It could help benefit conditions ranging from indigestion to respiratory issues to problems with inflammation. Let’s take a look at some more of these benefits in depth. Ginger tea could help with digestion issues by helping your body absorb more nutrients from your food, which in turn can help reduce bloating. Ginger contains digestive enzymes like the protease zingibain, which breaks down proteins into amino acids. Ginger tea might also help with symptoms of irritable bowel syndrome like cramping, gas, and constipation, and it could even help stimulate the appetite. Ginger tea may be able to aid the circulatory system as the antioxidant gingerol and shogaol compounds in ginger could prevent fat from depositing into the arteries. This could help prevent cardiovascular disease and complications such as chest pain, heart attacks, and strokes. Perhaps the most well-known of ginger tea benefits is nausea relief. For many, the tea helps soothe the symptoms of nausea, especially the type that comes with symptoms like motion sickness. Ginger tea, when mixed with turmeric, may help lower your blood sugar as well as stimulate insulin production within the body. Both ginger root and turmeric derive from the ginger family, Zingiberaceae. Turmeric contains the active ingredient curcumin, which is thought to help decrease levels of glucose in the blood. Ginger has long been known for its anti-inflammatory properties, and ginger tea is no different. A cup or two of ginger tea could help reduce inflammation, especially in the muscles and joints. The spasm-calming properties of ginger tea might be able to help you with the pain of menstrual cramps, but not only in the most obvious way. Take a cloth and soak it in ginger tea. Wipe the tea on your abdomen and you may find that it relieves some of the pain and relaxes the muscles. Drinking ginger tea may also help relieve some of the pain. Ginger tea could potentially help relieve stress due to its aroma and purported muscle-relaxing abilities. These are only a few of the health benefits that you may stand to gain from drinking and using ginger tea. But beyond these, you may be curious as to what the actual nutritional properties of ginger tea are. The great thing about ginger tea is that it has many great health benefits with little negative impact on your actual diet. In one cup of unsweetened ginger tea (eight fluid ounces), there is very little fat or carbohydrates. At the same time, there isn’t much nutritional value beyond trace amounts of sodium and protein. This is, in large part, due to what makes up ginger tea. Unsweetened ginger tea is essentially just ginger and hot water. Now, you can add to the nutritional value of ginger tea and even some of the health benefits by mixing in a few potent ingredients. Turmeric, for example, has long been mixed with ginger tea for its health and nutritional benefits. Turmeric and its compound curcumin add some more anti-inflammatory properties along with calcium, vitamin C, iron, potassium, and magnesium. As we’ve previously mentioned, there are numerous combinations of ginger tea that you can make that are great for your health and nutrition. Here are a few of our favorites. Simple ginger tea is easy to make and great for your health. Place grated ginger into a pot or container. Pour boiling water into the container and let it sit for 10 minutes. Then strain liquid into a mug and enjoy. Heat the water and slowly stir in the turmeric and ginger. When finished with the stirring, feel free to sweeten to your tastes with honey or stevia. Heat a small amount of the almond milk (do not bring to a boil). Add turmeric and ginger and stir in. When the ginger and turmeric are stirred in, add the rest of the almond milk. Add honey or stevia to taste if desired. There are other fixings you can add to change and boost the flavor of the teas. Cinnamon, for example, can be added to all of the teas we’ve listed for a fresh taste, but also to bring some more antioxidants to the tea—which may help to prevent conditions like heart disease and cancer. Ginger Tea Is Where It’s At! There is very little downside to adding ginger tea to your diet. It’s good for you, with many properties that can help improve your health. It has very little in the way of fats or carbohydrates, and it’s very easy to make in different combinations. But, if you do have any health concerns, it’s important to discuss them with a doctor just to make sure there aren’t any potential allergies or reactions to certain medications to watch out for. “The Health Benefits of Ginger Tea,” The Chopra Center; http://www.chopra.com/articles/the-health-benefits-of-ginger-tea#sm.000k9bww0184letbtc722rwmuvtns, last accessed June 12, 2017. “8 Health Benefits of Ginger Tea,” The Times of India, August 11, 2015; http://timesofindia.indiatimes.com/life-style/health-fitness/diet/8-health-benefits-of-ginger-tea/articleshow/27715978.cms, last accessed June 12, 2017. “Ginger Tea,” Fatsecret; https://www.fatsecret.com/calories-nutrition/generic/tea-ginger?portionid=5592501&portionamount=1.000, last accessed June 12, 2017. 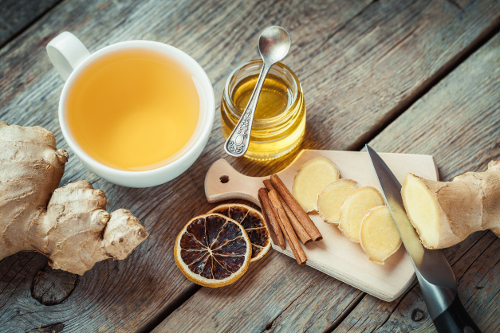 “Ginger Turmeric Tea: Nutrition Facts, Health Benefits, and How to Make It,” Foods 4 Better Health, March 6, 2017; http://www.foods4betterhealth.com/ginger-turmeric-tea-nutrition-facts-health-benefits-31634, last accessed June 12, 2017. Zhang, D., et al., “Curcumin and Diabetes: A Systematic Review,” Evidence-Based Complementary and Alternative Medicine : eCAM, 2013, 636053. http://doi.org/10.1155/2013/636053, last accessed June 12, 2017.